ETA, driven by innovation is calling young engineers to participate in ETA Innovation (e-NNOVATION) challenge 2 a one of its kind technology contest open to engineering students and fresh engineering graduate to sharpen their engineering skills and connect with experts in various engineering fields. Design a self-centering chuck which can hold both ID of brake flange and OD of a spindle. Maximum weight of the job would be 20 Kgs. The actuation to be automatic. Relatives/Siblings of ETA employees are not eligible to participate in this contest. ETA will select the winner of the awards. 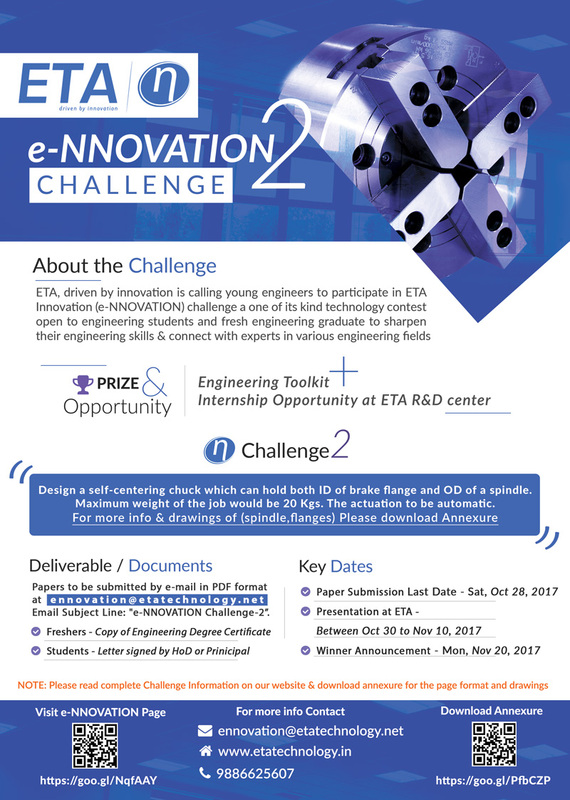 Papers should be submitted by e-mail in PDF format at ennovation@etatechnology.net using the subject line: “e-NNOVATION Challenge-2”.